‘cross season continueth. Never easy, so far mostly dry and fast (in fact I think the SUMMER ‘cross in Whitehven has been the only wet one!). Winter is on it’s way though…you can tell. After the tough start to the North West ‘cross league at Houghton Tower we were treated to a mini build up to the 3 Peaks (possibly more fun if you were doing it than if you weren’t!) at Rossendale. Described as “old school”, the part quarry, part boggy/tussocky moorland offered up more tough climbs (OK so any climb is tough when you’re already on your limit, but the escape from the quarry past the pits genuinely was a leg breaker), some exciting “will my front wheel disappear up to the hub in this puddle” moments and a delightfully miserable “run up” that reminded your calf muscles of what was to come on Simon Fell a few days later. My race went OK. No real issues, a few shambolic crashes here and there cost me time but 5th seemed like a decent result. A last lap puncture lost me more time but didn’t affect my finishing position (big thanks to everyone in the pits who had everything ready!). And then all of a sudden it was the 3 Peaks again! Race day was kicked off with some heavy rain hammering on the ‘van roof, making my question my sanity before I’d even got to the sign on tent. The all important pre race warm up was mostly spent hiding in the refreshment gazebo waiting for the deluge to stop, though I did manage to get myself nearer the front of the pack this time for the start, which made the “neutralised” ride over to Simon Fell feel slightly less hectic (still had to avoid two crashes though!). For some reason, Simon Fell just took ages to get going this time round. I remembered suddenly finding myself clambering up the steepest part in 2015, then almost instantly being at Rawnsley’s Leap, but on this occasion boggy field after boggy field just kept coming. The wire fence aided ‘hup’ just didn’t arrive for what felt like ages and even when it was finally over, there seemed to be twice as much singletrack to negotiate before the marshal assisted clamber over the stile. Weird. Anyway, by the time I’d dibbed in at the top I was sick of lugging the tonne of bike on my shoulder and my feet were sore from tripping over unforgiving rocks. So things seemed to be getting back to normal. The road section over to Whernside came and went fairly quickly. A decent group built up and we all did some work on the front to pull us along at a fair lick. I may have got a bit melodramatic at one point when chatting to Will Beresford (on his debut appearance) about how horrible the stone staircase up the next mountain was. But by the tenth minute of stumbling round on the uneven slabs pressed into the stupidly steep slope, just as ice cold rain started thrashing down, I felt it was totally justified. At least Simon Fell is a bit softer (and has a helpful wire handrail)! As with Ingleborough, the descent was taken with consideration rather than bravery. I hunted out a few lines I’d not found in previous years and immediately failed to remember them for the future. Oh well, at least I know they exist now! The next road section to the base of Pen-y-Ghent felt pretty tough into the wind, but again I got in a group that worked well together and reached Horton-in-Ribblesdale with a smile on my face. Just one mountain to go…and this one’s mostly rideable on the way up! Feeling in decent shape I put some effort in on the climb, making up a few places and reaching the final checkpoint in a decent enough time. The final descent felt easy. Although I was still reigning myself in a bit, all the repairs done to the trail over the past few years had transformed it from a final, rocky, tricky brake-burner into something almost simple. A few waterbars to hop, the odd rock to weave around, but for the most part the only real issue was dodging the riders still making their way up. With barely a week to recover it was back to the North West league, this time a Saturday/Sunday double header starting up in Cumbria for another great course. Not massively technical as such, but with some interesting “is it faster to run or ride” sections that seemed to change in character after each lap. I felt a bit down on power and got frustrated when my rear wheel pulled itself out of the dropouts (is there a more sickening sound than the teeth of a rear cassette getting mashed into the carbon fibre of the chainstay so hard you’re convinced the whole bike is about to snap?!) twice, costing me loads of time wrestling it back together while everyone raced off ahead of me. 8th place felt like a loss, even if there were a few extra ‘big hitters’ in attendance. 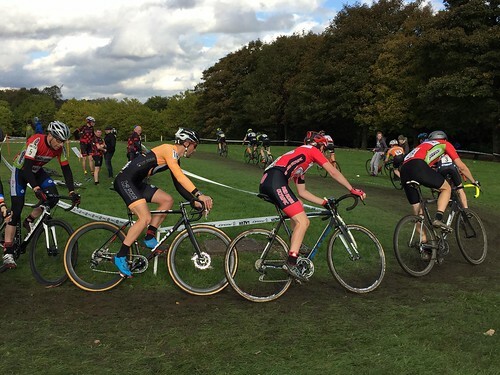 Sunday’s race was the always-fun Horwich race at Leverhulme Park. To my delight I felt a bit better and, although definitely not at full speed, enjoyed the race. Even the run ups were ace. 6th place seemed acceptable enough under the circumstances. 4th place wasn’t amazing, given who wasn’t there (if you see what I mean) but everyone in front of me beat me fair and square so the only thing I could be grumpy about was the lack of cups at the coffee cart post-race! Manchester was the venue for the next NW round. Heaton Park has been kind to me in the past (my first ever top 10 a few years back, even after starting at the very back of the pack) and equally harsh (last year’s Northern Champs just felt awful), so I had no idea what to expect other than a very fast course, given how dry the ground was. This time round it gave me the closest race I’ve had in a long time; a loose cleat in my left shoe lead to me slipping a pedal off the start, fighting my way back up from about 15th place into the top ten before a hilarious (if you weren’t me!) full pelt “aaarg I can’t get my foot out” crash into the barriers. 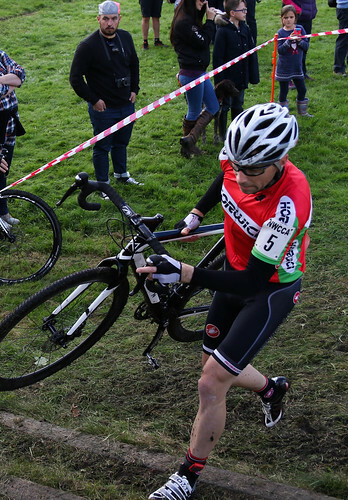 It cost me a bit of time on every lap as I fought to get unclipped from/clipped back into the pedals. However Martin Woffindin also had issues losing his chain on a few occasions, which left us both sprinting for the line side by side eventually crossing it so close together even the electronic timing down to a tenth of a second couldn’t split us! The commissaires awarded the 4th we were racing for to me (no idea how they could tell who got it! ), which was pretty good.